Lafayette Crime Stoppers 32nd Banquet was held on April 22, 2015 at the Petroleum Club. The guest speaker for the event was District Attorney Keith Stutes. Coordinator Paul Mouton presenting Vermillion Sheriff Officer award for Deputy Allen Bares to his family. Our Coordinators along with Sgt Greg Randell who gave the Invocation and Benediction for the Banquet. Another Successful Lafayette Crime Stoppers Banquet. 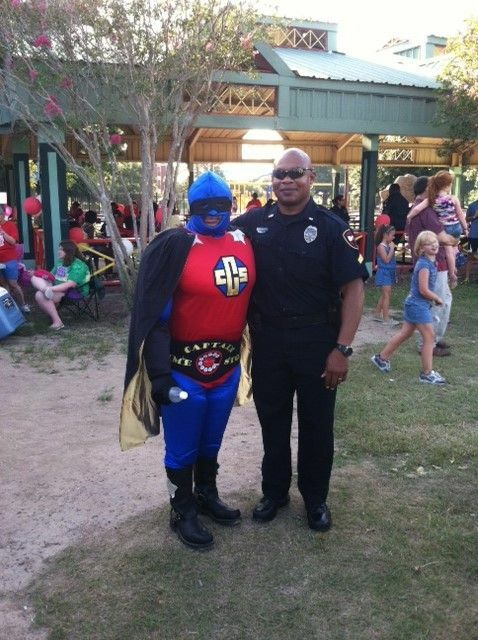 On Tuesday, August 5, 2014, residents throughout Lafayette Parish are invited to join forces with the Lafayette Police Department, the Lafayette Sheriff's Office, The Lafayette Fire Department and thousands of communities nationwide for the "Annual National Night Out." This unique crime prevention event will be held between the hours of 5:30 pm and 7:30 pm at the Girard Park Pavilion and Martin Luther King Center. This event will include music, entertainment, fun jumps, food, games and displays by the Lafayette Fire Department, the Lafayette Sheriff's Office, the Lafayette Police Department SWAT Team, Horse Patrol, Motorcycle Unit, Bicycle Patrol and the Police Command Bus. Target, a corporate sponsor for the event, will have employees on hand to assist with the event. "National Night Out" is the nation's largest annual crime prevention event with over 37 million people in 15,000 communities from all fifty states participating with their local law enforcement agencies. It is designed to heighten crime and drug prevention awareness, generate support for the participation in local anti-crime efforts: strengthen neighborhood spirit and police-community partnerships throughout the city and send a message to criminals letting them know neighborhoods are organized and fighting back. There will be events held in at Girard Park, and the Martin Luther King Center in Lafayette, as well as in the City of Broussard. All events are free to the public. The Lafayette Sheriff's Office and the Lafayette Police Department are extending an invitation to the Community to join us in this unique celebration. The Lafayette Crime Stoppers Banquet was held on April 23, 2014 at the Petroleum Club. The guest speaker for the event was Colonel Michael Edmonson with the Louisiana State Police. Many awards were given to outstanding Officers and Deputies through out the Parish. A special award was also given to Mr. Mike Barras who served on our Board of Directors from 1994-2013. 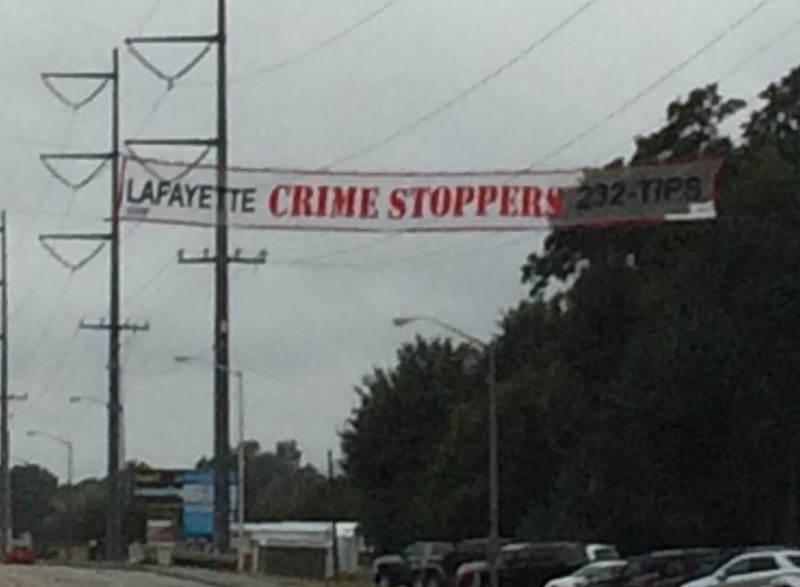 The new Lafayette Crime Stoppers Board of Directors were also installed for 2014. Here is a picture of the new Crime Stoppers billboard put up near the Lafayette Police Departments newest Precinct. Lafayette Parish law enforcement agencies are inviting the public to join them tonight at four parishwide events geared toward community crime prevention. National Night Out, the nation’s largest crime prevention event, is held in 15,000 communities in all 50 states to encourage police and community partnerships, local officials said. “It’s a way that we can connect with the community and the community can connect with itself,” Lafayette Police Department spokesman Cpl. Paul Mouton said. The events will feature SWAT teams, horse patrol, motorcycle units, bicycle patrols and the Lafayette Police command bus. There will also be music, fun jumps, food and games, Mouton said. The events will be held in Girard Park, Martin Luther King Center and in Broussard and Duson. Authorities will be on hand to talk to residents about crime concerns in their neighborhoods, Lafayette Parish Sheriff’s Office spokesman Capt. Craig Stansbury said. 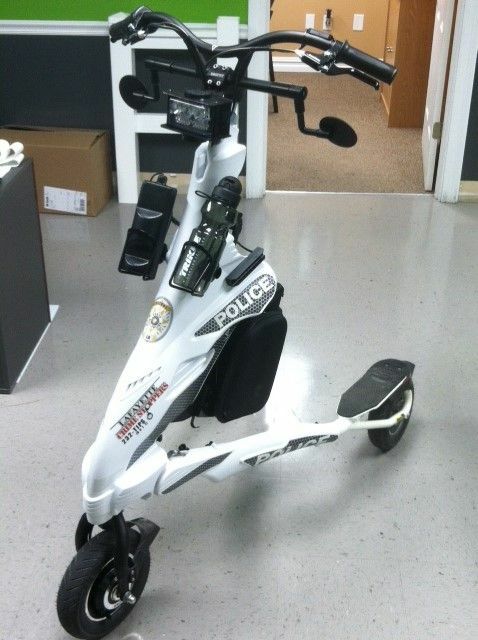 The Lafayette Crime Stoppers recently purchased a TRIKKE to be used by the Resource Officer at Acadiana High School in Scott La. This TRIKKE will be used as a tool for the Officer to be more visible at school and to be able to patrol the parking lots and the school areas more efficiently. This will allow for a faster response time from the officer when a situation arises on campus. See School Program Tab for a video of the TRIKKE being used in the school. The Lafayette Crime Stoppers Installation Banquet was held in April 2013 at the Petroleum Club where several Officers from different agencies were honored. Twenty-one (21) law enforcement officer from five agencies were also recognized for bringing a conclusion to the case of a missing Lafayette woman Mickey Shunick. The task force included members of the Lafayette Police Department, Lafayette Parish Sheriff's Office, University of Louisiana at Lafayette Police Department, the FBI and Louisiana State Police. 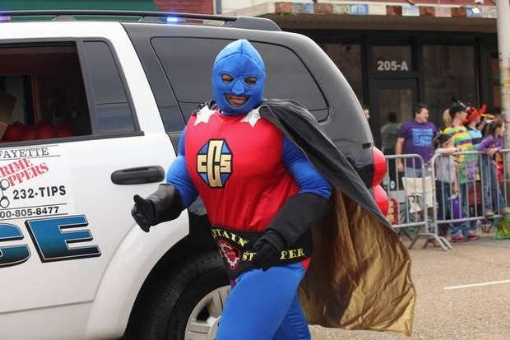 This is a picture of our own Captain Crime Stoppers during the Lafayette Mardi Gras parade. 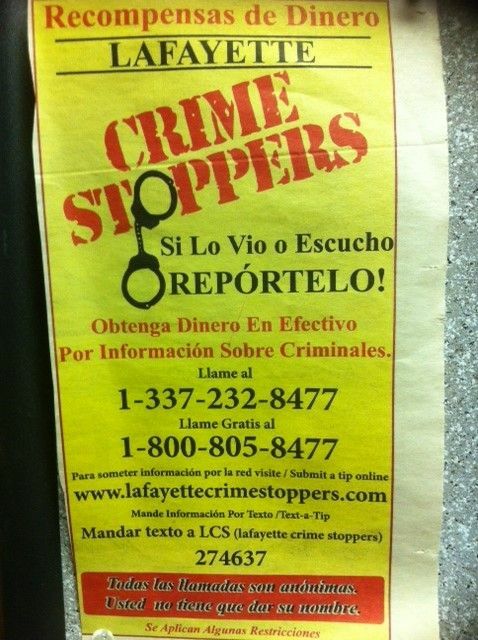 This is the current ad that Lafayette Crime Stoppers is running in a local Spanish newspaper called La Revista. This publicity helps to deter crime in the Spanish community in our area. LPD, LPSO invites residents to attend the "National Night Out Against Crime"
This unique crime prevention event will be held Tuesday, Aug. 2, from 5:30 p.m. to 7:30 p.m. at the Girard Park Pavilion. This event will include music, entertainment, food, games and displays by the Lafayette Fire Department, the Lafayette Sheriff's Office, the Lafayette Police Department SWAT Team, Horse Patrol, Motorcycle Unit, Bicycle Patrol and the Police Command Bus. Target, a corporate sponsor for the event, will have employees on hand to assist with the event. “National Night Out” is the nation’s largest annual crime prevention event with over 37 million people in 15,000 communities from all 50 states participating with their local law enforcement agencies. It is designed to heighten crime and drug prevention awareness, generate support for the participation in local anti-crime efforts: strengthen neighborhood spirit and police-community partnerships throughout the city and send a message to criminals letting them know neighborhoods are organized and fighting back. Arko, a Belgian Malinois, was the first Lafayette City-Parish K-9 marshal. He died after undergoing emergency surgery for a flipped stomach. A fund has been established at Whitney Bank to help pay for the purchase of a new canine. The account number is 716885093. Contributions may be made at any Whitney Bank location or by calling 291-8723 or 291-8724. The Lafayette City Marshal's Office is mourning the sudden death of Arko, the first canine in the agency's 100-year history. 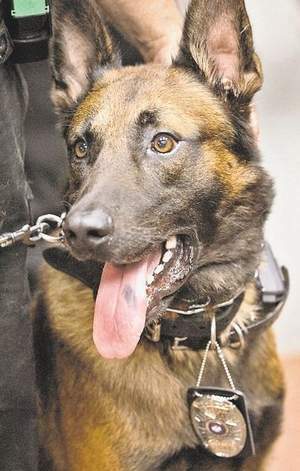 Arko, a dual-trained Belgian Malinois, died last week after undergoing emergency surgery, Marshal Nicky Picard said. He was under a veterinarian's care at the time of his death. Picard said Arko's handler, Deputy Allan Roger, noticed that the dog wasn't acting like himself as he prepared to take part in a competition in Baton Rouge. A trip to the vet revealed that Arko had a condition in which the animal's stomach flips. "We understand that about 60,000 dogs a year die from this," Picard said. "From what the vet told us, it usually happens with dogs with a big chest cavity and who are very active, and they see it a lot in greyhounds. They also see it happen in horses and cattle." accompanied deputies as they sought suspects who had outstanding warrants. He also helped search for drugs and worked with several other law enforcement agencies in the Acadiana area. "He worked with the federal marshals, the state police, basically anybody who called us," Picard said. "He was in a manhunt in St. Martin Parish. Whenever they needed him, we would send him out." Roger was particularly upset and was with Arko at the time of his death. Roger's blood pressure spiked and he required hospital treatment, but he has since returned to work. "He (Roger) was so close to Arko. He and his wife and his mother all cried about it. It was like losing a son, because Arko was a part of their family," Picard said. "But a nice thing was that a lot of handlers from other agencies met with him and brought their dogs, and that has really helped him." The office is in the process of trying to purchase another canine. Picard said another dog, Renzo, has been working with Roger within the past few days to see if they are a compatible match. A dog and its handler must work together for at least eight weeks before they can go out in the community together. Arko's remains were cremated. A memorial service is planned for a later date. Deputies will wear black bands across their badges until April 15 in honor of Arko. 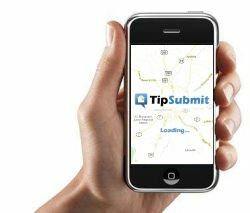 TipSubmit Mobile is new mobile tip submission application that offers many great new features and benefits vs. any existing tip submission processes. Tipsters get the convenience of submitting tips from their mobile device with the immediacy of SMS text tipping but without having to rely on the SMS text tip platform and limitations. Images may now be included, unlimited length messages, fully anonymous two-way dialogue and even virtual chat mode when both parties are online. There is a definite place for SMS text tips in this world but our all new TipSubmit Mobile application does indeed take things to the next level for effectiveness and efficiency. Lafayette Crime Stoppers recently made a donation to help in the purchase of a Narcotics Canine named Arko for the City Marshals Office. Arko and Marshal Nicky Picard. 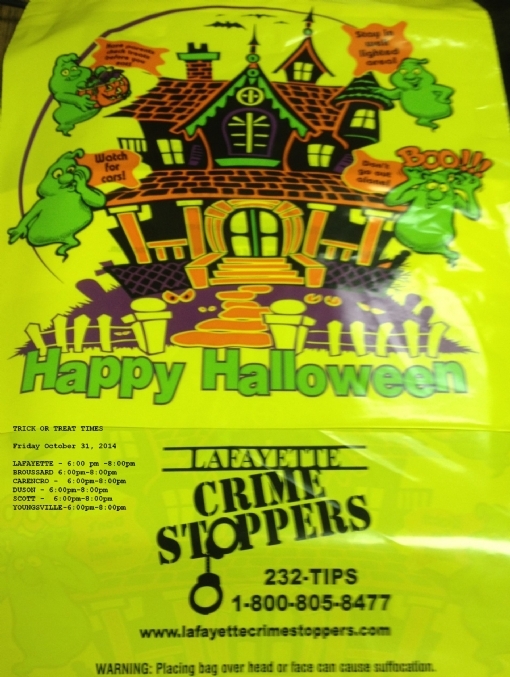 Lafayette Crime Stoppers have developed a safe and secure anonymous text message crime tip system. By adding this capability to the Crime Stoppers arsenal, we expect to generate a much greater level of communication with the citizens we serve. Sending a text message or SMS (Short Message Service) is simple and convenient. All a tipster must remember is the phone number assigned to our text messaging system. This number is CRIMES (274637). There are no key words to remember just a single phone number. Within seconds of a tipster sending a text tip, a text message is returned automatically to the tipster. This message acknowledges receipt of the tip and it gives the tipster a unique tip number which may be used to refer to their tip at a later date when providing new information or checking on tip for reward status. All text messages are encrypted and are totally anonymous. There is no cost to use this program other than standard messaging fees that may be charged by your Wireless Service Provider. No one ever receives information regarding the tipster’s name or phone number. Tipsters are also advised to delete their tip text messages for safety reasons. Text message at LCS153 plus your message to CRIMES (274637). All tipsters remain anonymous and may be eligible for a reward of up to $1000.00. Thanks to the Lafayette Crime Stoppers Board of Directors for the donation of a brand new four horse trailer given to the Lafayette Police Department Mounted Unit. This trailer will be seen all over Acadiana as the Mounted Unit assists area agencies with parades and crowd control.